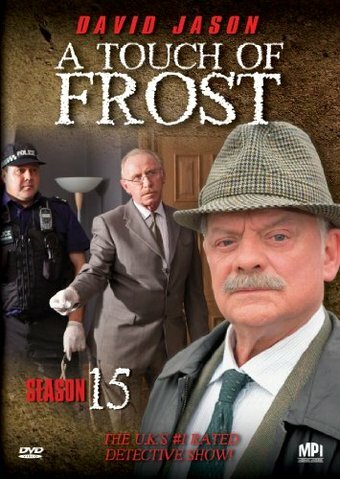 The concluding series of one of Britain's most beloved and longest-running detective programs, A TOUCH OF FROST, appears in this box set. The fifteenth season (comprised of two installments - IF DOGS RUN FREE, parts one and two) originally ran on English television between April 4th and 5th , 2010. The episodes continue the ongoing adventures of Detective Inspector Jack Frost (Sir David Jason), an investigator (based in the town of Denton, England) with an uncanny knack for drawing trouble to himself like a magnet. This time around, Frost invades an illegal dog-fighting ring but accidentally triggers a brutal murder; meanwhile, he also runs headfirst into a series of copycat serial killings that may be targeting him as the next victim, and finally stumbles onto lasting love - if he can only live long enough to enjoy it.